So here its is nearly 2 years of my blog there's been tears, toils ,smiles, cross words , happy words and that's just from Mr T about my cooking. Before I descend into a stereotypical 1970's sitcom I have a superb giveaway to tell you about to celebrate my blog, I am going to give away a microwave , I am very excited. So its thanks to John Lewis who have a good choice of microwaves to purchase amongst otherhousehold appliances. 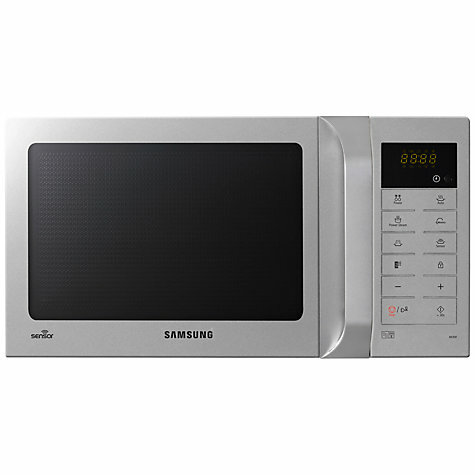 So the prize in question is this microwave from Samsung. So what's the burning question for the competition." What would your ideal product from John Lewis be ?" I know for me I would love a new sofa has my current sofa is looking a bit cat eaten to say the least. My favourite toy was my Tiny Tears doll. It was amazing that she would wee herself! Imagine that?! Definitely a new sofa, mine is old and broken and was pre loved when I moved in so am yet to buy my actual first new sofa! We need a new sofa too, although trying to put it off until we move. I have to admit I keep getting drawn into John Lewis's puchchair department. I'm not sure it's practical, I'd love an UppaBaby Vista. I need some new bedding - mine is looking a bit tired (sorry!!). I quite fancy the Egyptian Cotton set - just lovely! Im after a microwave and this one looks fab! I'd love an iPad especially as it comes with a 2 year guarantee from John Lewis. Foras Surmi Planter, Natural Slate, Square better than plastic terracotta wouldn't you say? They look fab and are a great gadget to have in the kitchen. I'd love the Bosch slimline dishwasher, mine really does need changing and this model has such fantastic reviews. A new sofa, one that doesn't poke you with its springs! A jelly bean rug - I have been eyeing up forever, including today! I'd love a dishwasher (and the space to fit one!) Or a kitchen aid mixer. My dream product would be a state-of-the-art home cinema system. Hmm, tough one! But I'd have to say a new oven, in fact I'm off to look at them today! Towels, bed linen, things that freshen up a room in an instant. Tricky - though at the minute I would say a new sofa for my daughter for when she moves in with her boyfriend later this year. That would be a fab garden lounge! New imac would be ideal from John Lewis since they do a 2 year warranty which is more than apple. A new Ipod - mine is about 10 years old now ! Nice new netbook. What? It's a work tool, honest. I think I'd have to choose a new camera. I need a new camera as mine keeps messing about! An iPad! Mine is dying slowly. a tablet.. any tablet. tweeting from my phone doesn't quite suit my fat fingers! An upright freezer. I have a chest freezer and it is a nightmare to find anything! Happy blogoversary! My dream "product" would be a trolley dash in the perfume department, but since that probably doesn't count I'll have a decent laptop instead please. I think it would have to be the KitchenAid Artisan Stand Mixer in the bright red colour, it would be a bit of a luxury as there are many household items that I need much more than this but this would be a real treat for me. I have my eye on a new salter scale with a backlight! Mine would be an Ipad. A new cooker because mine has broke! I would love a new washing machine from John Lewis because mine is on its last legs and sometimes washing comes out of it dirtier than it went in. Having said that, my once white microwave has yellowed with age and it refuses to work if the weather is really cold which is very annoying if I fancy a bowl of porridge in the morning. A kitchenaid mixer to assist me with my baking. Sad, as it's not very romantic, but it would have to be the Miele W5000 Supertronic Washing Machine. A new microwave, mine broke ages ago.... using a very old decrepit one we took out of the loft for emergancies! It is rubbish and so slow! However, I'd be most happy with a microwave, I think it's about time I owned one. Otterman Storage bed for spare bed room as thats were i seem to spend most of my nights due to hubies snoring i would have a really good comfortable mattress on it and also it would be a great place to hide shoes i seem to have bought :) and maybe keep a chocolate stash in there too just for me as kids and OH always seem to find treats first. A new mattress for me and the dogs. A new cooker. The sparky ignition bit has just given up on mine. A new cooker, mine is slowly giving up. An iPad would be my dream buy from John Lewis! love to get a new wardrobe for spring! Without question, the Nespresso CVA3660 Built-in Coffee Machine by Miele. Monday's would never be grey again! Samsung ME89F-1SS Microwave Oven, as mine is so old it will stop working soon I'm sure. a big 3D TV with all the whistles and bells! I'd love to win a microwave as I've had mine for 10 years and it was taken out of someone's old fitted kitchen so a bit of a dinosaur!! My dream product from John Lewis would be one of their luxury snuggly bathrobes! O M Goodness! What a thing to ask - how long is a piece of string? i love the rug that looks like its made of jellybeans! a new microwave since ours was given free to us. A coffee machine, been wanting one for ages. waiting forever for things to defrost. That washing machine would be ideal for me! I would love a Blu Ray player, as our DVD player has just broken. Boring but essential: a new drawer divan bed. Hubby wants a sound bar for the TV! a new sofa, mine has seen better days! a suitcase with a handle on, wheels would be good too! I am in dire need of a new bed, or at least a new mattress, I have turned it around at least twice as well as upside down. Together a different time and generation.